Home » #ElMontePromise » News » Save for College Launch a Smash! 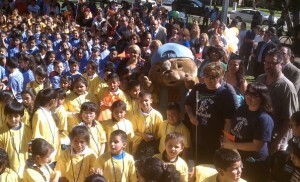 Today’s El Monte Promise Foundation Save for College Scholar’s Savings Program launch was a smashing success! Over 500 El Monte Unified School District 1st graders pledged with Sammy Rabbit, children’s author Sam X Renick, dignitaries and leaders from around the nation to get in the habit of saving and reading so they can make big dreams come true, like going to and graduating from college. Kudos to the El Monte Promise Foundation and all its stakeholders for investing in and inspiring a new generation of scholars, savers, and leaders! Dream and do big! Go El Monte Promise Foundation! Go El Monte Scholars and Savers!